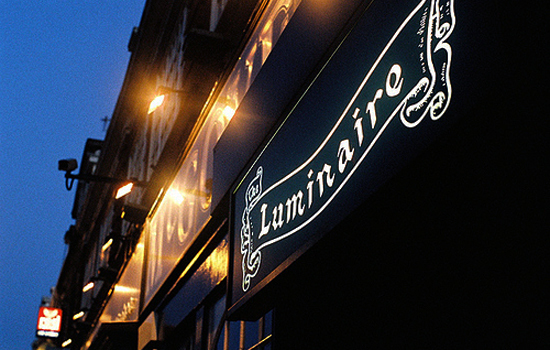 The Luminaire was that rare thing (rare in the UK, certainly): an independent, quality live music venue that cared about artists and audience. Living in Brighton, I wasn’t exactly on its doorstep, but I saw more than my fair share of shows there and was involved ‘behind the scenes’ in a good few too. Without exception, every time I went there the staff were attentive, helpful and concerned that the majority of people should have a good time enjoying the music. It lasted five years and hosted some exceptional shows (see, happy band does equal better gig), punching well above their weight when the competition was Clear Channel/Mean Fiddler/Borderline (post sell-off) et al. Two consecutive nights at the Luminaire (as many bands did) was always a better prospect than one in a soulless sound-pit. 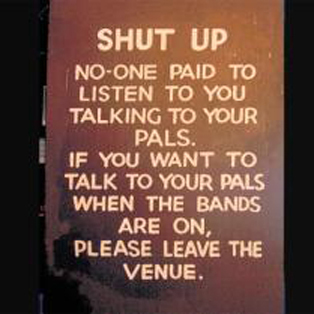 Word got around: bands and agents talk to each other, and most agreed that this was probably the best live music venue in the UK. While the imminent closure of the (more famous) fabled 100 Club has gained some press attention and a campaign to save it, I really hope the same might happen for “the Lumi”; hell, maybe Chuck Norris will come and save the day! I can’t imagine a live music world without it… well, I can, but it’s one of branded venues selling crap beer, charging over the odds, and treating both bands and punters like cattle. Andy, John, Danny, Frid, Jen, Molly and many others I didn't meet: you did a great job. Thank you! 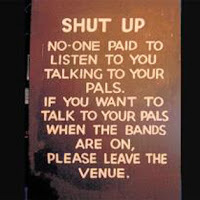 Lesson: support your local independent music venue. You’ll miss it when it’s too late! After recently buying a 'proper' turntable, I've been heavily biased towards vinyl - both listening to long-cherished, long-owned albums as well as buying new releases on wax in preference to CDs. This trend was bucked last weekend at a record fair in Brighton, when I chanced across a CD copy of 'Flubber', the second album by Souled American. Had the vinyl for yonks, and the 1999 CD reissue, but finding the original CD caused an audible gasp - the kind that makes a stall-holder wish they'd stuck a £10 price tag on a disc rather than the quid or so it cost me. Thus, a marathon Souled American session has ensued. Whenever this happens, I end up telling everyone I speak to - and reminding those I told last time I was 'under the influence' - just how incredible this band is. They released six albums (four on Rough Trade, two on German label, Moll); the first ‘Fe’ in1988, two years before Uncle Tupelo put out a record and six years before The Jayhawks broke through with ‘Hollywood Town Hall’. So, yes, you may never have heard of them but they were truly ground-breaking. Soporific and swampy, slow and sweet, with each record they became progressively slower and more intense – a classic example of ‘less is more’. Jim Becker of Califone (and sometimes Souled American) once characterised them to me as getting more stoned with each record, to the point were now they can’t get off the sofa: in fact, Califone are a good indication of a band developing what SA started (both produced by Brian Deck). I should add that the band haven't officially packed it in, but new material is no more than a trickle (one original song since 1997). This has perhaps served only to increase their myth, as the tributes build up - John Darnielle of the Mountain Goats wrote a glowing piece for Harp magazine (although it is no longer available online) claiming them one of very few bands he would write for or whose songs he would cover. It’s often claimed that humans only use 10% of their brain: people who make such claims have probably never listened to Souled American, I think if you can find ‘Fe’, ‘Flubber’, ‘Around The Horn’, ‘Sonny’ (all these re-released by American indie label Tumult in 1999), ‘Frozen’ or ‘Notes Campfire’, you’re looking at alt-country’s answer to latter-day Talk Talk or what might have happened had Michael Hurley joined Meat Puppets. Buy them. I was feeling a little down at the news that the mighty Centro-matic were over in Europe (small print: Spain only) and not coming to the UK. So, I decided to indulge myself with a marathon Centro-matic session, starting with the still-incredible-after-all-these-years Redo The Stacks. A monumental album that calls to mind everyone from Guided By Voices to Nirvana (that's a broad enough spectrum, right? ), and by the mid-point I'd decided I wanted to share a bit with some potential Centro-virgins among my Facebook contacts. My disappointment at not finding anything bar some shaky live clips (great, but always work better when you were there) was suddenly obliterated by a link to a track I hadn't heard of before. Now, it's not unlikely that even the most devoted fan has missed a track or two, since Will Johnson is arguably the most prolific songwriter around - but, wait, this one has a shiny video attached to it and REALLY IS a BRAND NEW CENTRO-MATIC song! What's more, as the supporting Vimeo page claims, it's a pre-cursor to a forthcoming new album, Candidate Waltz, in 2011. Will's been working even harder lately, and if you managed to get to any Monsters Of Folk shows, you'll recognise him as the 'fifth Beatle' in that project. Big as fan as I am of Jim James and M Ward (we'll leave Conor Oberst out of it...) I was very excited to see Will involved. Such exposure can only bring good things for Centro-matic (and of course South San Gabriel). As well as the MoF shows, he's been on the road and in people's houses with Anders Parker (another 'guest drummer' strand here, but that's for another time): Anders is a truly exceptional performer, songwriter, guitarist and all-round top dude. 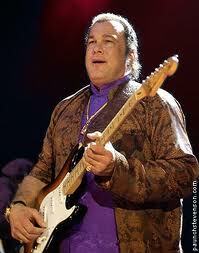 You should check out his great 'Tell It To The Dust album (Baryon, 2004). Hmmm, I wonder if Will decorated any of the living rooms they played in too? What of the other guys...? So, no critical commentary on the video: no, I'm too excited for objective analysis and - besides - my computer doesn't get on with Vimeo. Everything's jerky video and stop-start audio, so you'll likely be enjoying the film way more than I can at the moment. Please share this with everyone you know - is that what the kids mean by 'viral'? And, if you're in or near Spain in the next couple of weeks, fair play to you - you lucky so-and-so's. Send us a postcard eh?